Although we use the word plain to describe this group of our faux fur throws, many of them are not totally plain. Some are mottled in appearance, and some have one colour at the base of the fur but are tipped with another colour. This group of fur throws will fit into most situations; traditional or modern, bedroom or living room. A mid to light grey faux fur throw. Plain, medium length fur. Versatile and luxurious. Will fit into most colour schemes, bedroom, lounge, pet or picnic blanket. A long length, dense, plain faux fur throw in a beautiful soft baby blue colour. Perfect for bedrooms and childrens rooms, or pastel colour schemes. A mid - dark grey, medium length grey fur blanket. Very competitively priced coming in a choice of 9 standard sizes together with our usual bespoke service. A good all-rounder. Easy to maintain. One of many of our grey fur throws. A rich deep brown faux fur throw. Medium length, plain fur. Suitable for sofa and chair throws equally as much as bed throws or bedspreads. 9 standard sizes available and bespoke service. A lustrous shiny black, plain, long-haired faux fur throw. A dense undercoat coupled with longer black hair. Our usual range of 9 standard sizes or contact us for bespoke sizes. Shiney black, medium length plain faux fur throw in a range of 9 standard sizes and choice of 3 backings. An economically priced collection of faux fur throws. A rich brown faux fur throw with a dense undercoat and longer, darker, brown hairs. A superb quality faux fur which can be used independently or in conjunction with contrasting cream or beige cushions. A long length, dense, plain faux fur throw in a beautiful soft baby salmon-pink. Perfect for bedrooms and childrens rooms, or pastel colour schemes. A cream faux fur throw of medium length. Easy aftercare, suitable for many interiors where a light plain fur is needed. Economically priced. Perfectly suited as a cream sofa throw or cream bed throw. A long-haired, slightly off-white, soft, faux fur. Made up of varying lengths of hairs. Superb quality, suitable for most colour schemes. 9 standard sizes available, together with a choice of 3 backings. Also bespoke sizes produced. Matching cushions available. Faux fur throw Foxglove is a beautiful combination of pale lilac with hints of pink. Long-haired and dense soft fur make this a very luxurious throw. Wide choice of sizes and our usual bespoke service available. A faux fur throw with strong Magenta colouring; that's our New Milano Magenta. Soft, medium length, dense, fur create these luxury faux fur throws. Ideally suited for bed throws or sofa throws. Add a splash of colour! This beautiful faux fur throw, called Spring Willow, is a pale pistachio green in colour. 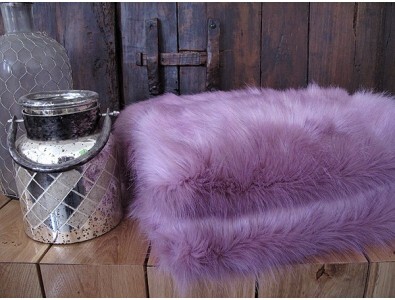 It has a dense and soft medium length fur; ideal for adding some colour to your decor. A striking grey faux fur throw interspersed with long black hairs. A dense and warm undercoat. This fur makes a real design statement and will fit into almost any room. A long haired, soft dense faux fur in beautiful gold and wheat colouring with brown tipped hairs. Quality and luxury at an affordable price. A new faux fur throw to our range; Saharan Fox. Long-haired and dense, ivory in colour with light brown hairs. We know that this faux fur throw will prove a success. A beautiful white faux fur throw with a medium length fur. Plain, simple, luxurious. 9 standard sizes or a bespoke service. Choice of backing. White bed throw or white sofa throw; you choose. Perhaps one of each?